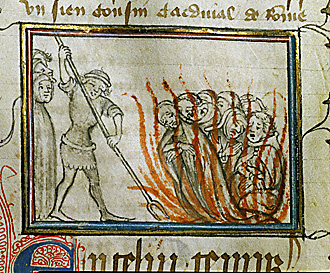 Medieval manuscript, 14th century of Templars (heretics) being put to death by Catholic authorities. "Separation of Church and State" is CONDEMNED by the Church. (Syllabus Errorum, 55., 1864) The enemies of order will get their due, with the 3 Days of Darkness ... Pray for the Great Catholic Monarch, now in exile!